Every pleasure vessel including canoes, kayaks and rowboats operated upon the waters of NYS must have on board one United States Coast Guard approved wearable Personal Flotation Device (PFD) for each person on the vessel. The state of New York requires one wearable Type I, II, III, or V PFD for each person that is aboard a vessel. All PFDs must be readily accessible. In addition to the above requirement, one Type IV U.S. Coast Guard-approved PFD must be on board vessels 16 feet or longer and readily accessible. All Personal Watercraft (PWC) occupants must be wearing a PFD. Any person towed behind a vessel must be wearing a PFD. All persons on any vessel (this includes motor boats, sailboats, kayaks, canoes, or rowboats) less than 21 feet, must wear a life jacket from November 1 to May 1 when underway. Children under 12 years of age, on any vessel 65 feet or less in length must wear a U.S. Coast Guard approved type I, II or III PFD, while underway. The foregoing requirements do not apply to children less than 12 years of age when situated within a fully enclosed cabin. In order for any PFD to be considered properly worn all straps and/or zippers must be tied or zipped. No one may operate a vessel on the waters of New York State while impaired or intoxicated either through the consumption of alcohol or drugs. New York law prescribes heavy fines, imprisonment, and the suspension of operator privileges for violators. In New York, if you are stopped for suspicion of impaired operation and refuse to voluntarily submit to a breath test, your privilege to operate may be immediately suspended, pending a hearing. A person shall be considered under the influence of alcohol if the ratio of alcohol in the blood is 0.08 per cent or more. If the operator is under 21 years of age and is caught drinking while operating a vessel, their operating privileges will be suspended or revoked. The New York State Office of Parks, Recreation and Historic Preservation regulates the state boating laws in the state of New York. 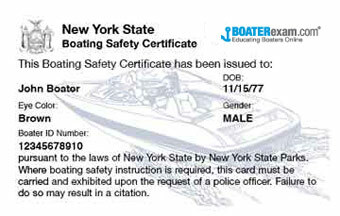 All vessels propelled by machinery, including gasoline, diesel and electric motors, and principally operated on New York waters must be registered and issued a New York Certificate of Registration by the New York State Department of Motor Vehicles. 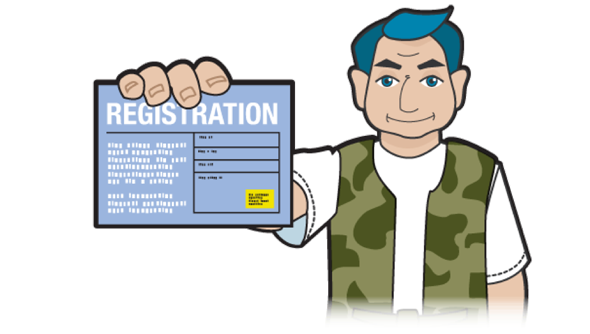 The registration certificate is your proof of current registration. It may also be your only proof of ownership unless the vessel is titled or documented. Vessel operators, whether they are the owner or not, must carry the vessel's original certificate of registration onboard at all times. When a vessel is sold, the certificate of registration or title must be signed over to the new owner. The original owner should notify the Department of Motor Vehicles of the name and address of the new owner, as well as the date of transfer and the registration number of the vessel. In order to protect yourself when transferring ownership of any vessel, the validation stickers should be removed from the hull prior to turning the boat over to the new owner. This will ensure that the new owner will not use the vessel until it has been properly registered with Motor Vehicles in his or her name. The owner of any registered vessel must notify the Department of Motor Vehicles within ten (10) days of a change in address. This change should also be noted on the registration certification. If a boat is stolen, lost, abandoned, or destroyed, the owner must notify the Department of Motor Vehicles in writing within fifteen (15) days. The local law enforcement agency should be notified when a lost or stolen boat is recovered. The Department of Motor Vehicles will send you a registration renewal at the appropriate time. Check to see that all information on the renewal is correct, then sign and return the renewal notice along with the specified fee. When a vessel with propulsion machinery is successfully registered, the boat owner is issued, a certificate of number or registration, physical boat numbers and a decal. The registration must be kept on board the vessel at all times. The registration number consists of the letters "NY" followed by four numbers and two letters. A space, or hyphen, the width of a letter, must separate the first and last two letters from the four middle numbers. For example, NY 1234 AB or NY-1234-AB. The numbers must be painted or permanently attached to both sides of the vessels bow, should read from left to right, be of block letters not less than three inches in height, and of a color that contrasts with that of the hull. The registration number should be the only number on the forward half of the vessel and should be clearly visible and readable from a distance of at least one hundred (100) feet during daylight hours. This number may not be transferred to another vessel. Non-native aquatic species (plants, fish and animals) are invading New York's waters. These pests can increase dramatically under the right conditions, displacing native species, clogging waterways, and impacting navigation and recreation. Once introduced, they are nearly impossible to eliminate. Zebra Mussels are nuisance species that can be accidentally transported by recreational boaters when caught in propellers, intakes or attached to hulls. State law specifically regulates the operation of personal watercraft (PWC), and while most sections of the navigation law also apply to all PWC. must be worn by each person on or towed behind (strength tested models recommended). Fully inflatable PFDs must not be used. if so equipped must be functional and attached to the operator. capable of a two second blast, audible ½ mile must be carried aboard. a fluorescent orange flag (1 foot square) or other appropriate U.S. Coast Guard approved distress signaling device must be carried aboard. manufacturer installed, must not be removed as it prevents explosion/fire. manufacturer installed, do not remove, removes potentially explosive vapors from engine/fuel space. Note: Although an anchor and fire extinguisher are not required under state law, Federal rules do require a fire extinguisher on board all PWCs. Personal watercraft may only be operated between sunrise and sunset. The installation of an aftermarket light kit will NOT allow you to legally operate a PWC at night.